For months, one Paralympian champion has dominated the headlines: we're talking, of course, about Oscar Pistorius and his murder trial. The Blade Runner first raced his way into fame in the 2012 London Summer Olympics, and then into infamy the following Valentine's Day when he shot girlfriend Reeva Steenkamp. The lengthy and seemingly unending trial has brought considerable attention to Pistorius and his alleged crimes, and has meant that one man and one story has overshadowed the other remarkable men and women in the same community. Oscar Pistorius has garnered more headlines than any other Paralympian athlete in recent memory, and while his athletic accomplishments are undeniably impressive, it's time to spotlight the other incredibly accomplished Paralympian athletes who have achieved greatness in the sport arena and beyond. These phenomenal individuals have overcome a variety of handicaps, from birth defects to amputations; have faced seemingly incontrovertible obstacles; and have not only succeeded, but excelled. This amazing swimmer made history in 2008 by becoming the first Paralympian to qualify for the Olympic Games. And not only did she qualify, but she took 16th in the 10k, or "marathon" race. Du Toit's left leg was amputated at the knee in 2001 following a scooter accident, but rather than letting her disability end her already promising swimming career, the 17-year-old was back in the water a mere three months later. She competed in the 2004, 2008, and 2012 Paralympic Games, and over the course of her career, won 13 Paralympic gold medals. Incredibly, Du Toit swims without the aid of a prosthetic leg. Born with spina bifida, a disease that affects the development of the vertebrae surrounding the spinal cord, Tanni Grey-Thompson never let her wheelchair become an obstacle. Instead, the 44-year-old has become one of the most decorated paralympians in the history of the UK. She won 11 gold medals at the Paralympic Games, and also won the London Marathon six times between 1992 and 2002. Since retiring from her athletic career, Grey-Thompson has made her way into Parliament, is a well-known television presenter, and sits on the board of numerous athletic committees and charities. Winning a medal is only a small part of the achievements of many paralympic athletes, and no one proves that better than Derek Derenalagi. Formerly a soldier in the British army, Derenalagi was severely injured when his vehicle was struck by an improvised explosive device in Afghanistan. Doctors declared him dead, but Derenalagi miraculously survived and doctors detected a faint pulse. Both his legs were amputated, and he was in a coma for eight days, and remained in the hospital for another three weeks. After returning to his health and qualifying to compete in the 2012 Paralympics as a discus thrower, he was greeted as a hero by an enthusiastic crowd. Although he did not medal, he is undoubtedly a winner. Though she was born with achondroplasia, a common cause of dwarfism, Erin Popovich's small stature has never served as a deterrent — especially not in the pool. She won an incredible 14 gold medals over the course of three Paralympic games, and also still holds two world records and two Paralympic records. Popovich did not join a swim team until she was 12, but only three years later, she was competing in the 2000 Paralympic Games, where she won three gold and three silver medals, and set four world records and three silvers, and set four world records. At the 2004 games, Popovich won more gold medals than Michael Phelps. Though athletes are often thought to have short shelf-lives, Franz Nietlispach entirely breaks with tradition. Having competed in every Paralympic Games from 1976 to 2008, Nietlispach certainly proves that paralympic athletes are not only good, they also are long-lasting. Not only is his longevity impressive, but his range of talents is equally astounding. 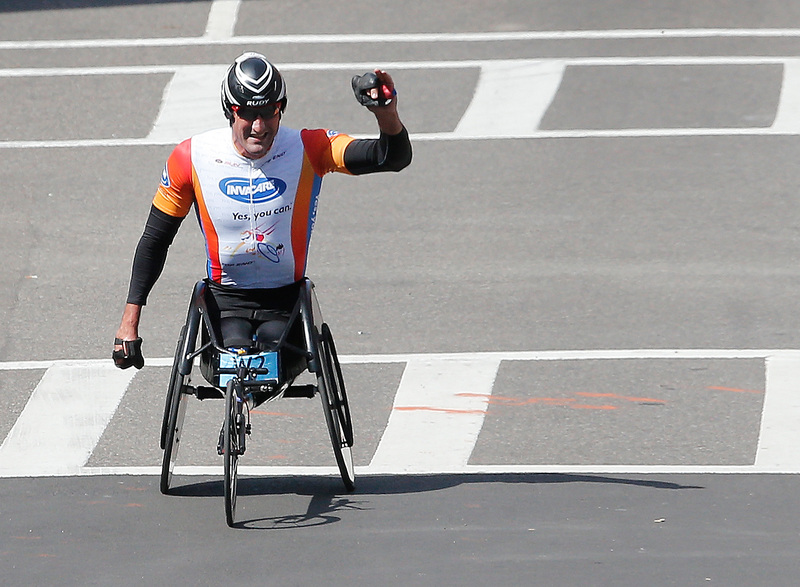 Nietlispach has qualified to compete in wheelchair racing, table tennis, and road cycling. He's managed 21 medals, 14 of them gold.